This recipe for Lime Infused Beef Stir Fry Avocado Salad was inspired by a Cuban Dish, Vaca Frita. Instead of making the beef crispy we stir fried it and seasoned it with fresh lime juice then served with a simple Avocado Salad with thin slices of red onion. A light and refreshing dinner, perfect for a hot summer night or a cold San Francisco one. I was inspired to make this dish after reading an article in Food and Wine magazine about Cuban Food. I have always been intrigued by Cuban food, even though, I have never had it. Lenny has had bad experiences with it and thinks it is all about grilled cheese (??). When I told him about this woman, Lourdes Castro, that I read about and that I was going to try out or sort of try out a recipe, he just said, “we’ll see”! I always love to hear a story about a cook and/or chef who is self-taught, something romantic about it. Lourdes Castro did not learn from her mother, in fact, she said her mother is a bad cook. She did not become interested in food until she went to college in NY and then she became a self-taught chef. She hosts cooking classes about Cuban Food and has written cookbooks. 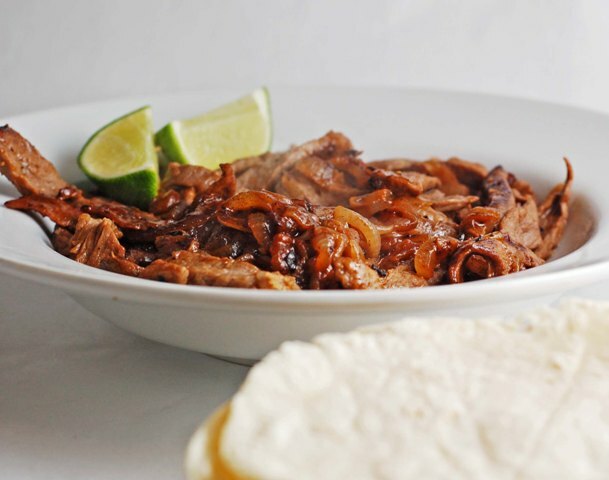 She shared a recipe for Vaca Frita: Crispy Beef, which is a beef dish that is marinated in lime juice and then cooked until crispy. Unfortunately, when I read the recipe (or thought I read the recipe), I neglected to see that I needed a green pepper and that I needed to boil the meat, let it marinate for an hour and a half and then cook it crispy; there was no way this was going to happen on a work out night. Instead, I sliced the meat thinly and then I sauteed it with garlic and onions and seasoned it with lots of fresh lime juice and salt and pepper. Served alongside was a simple avocado salad and warmed corn tortillas. The lime juice in the meat was a great compliment to the creamy avocado and red onions. This dish was flavorful, very easy to make and a big hit! The only thing missing was a mojito! Heat the olive oil in a large frying pan. Saute the onions until caramelized, about 15 – 20 minutes. Add the garlic, stir and cook for another 5 minutes. Raise the heat to a high medium, add the beef, and quickly stir-fry until cooked to your liking. Add the lime juice. Stir and cook for about 3 – 5 minutes, until fragrant and heated through. Season with salt and pepper. 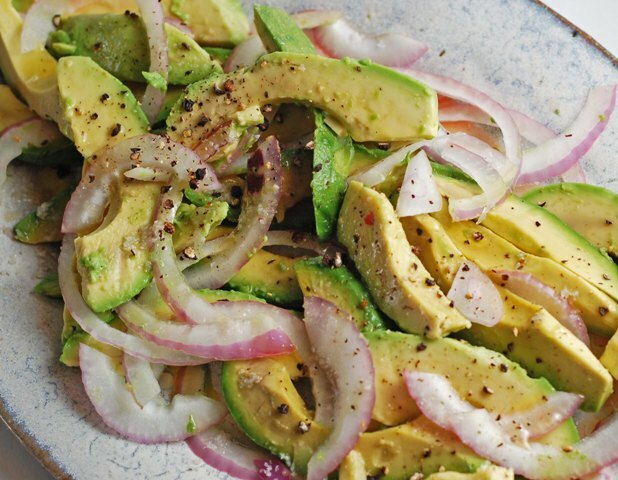 Arrange the avocado and onion slices on a plate, then top with the beef mixtures. Drizzle with the olive oil and vinegar. Sprinkle with the sea salt and pepper. 6 Responses to "Lime Infused Beef Stir Fry Avocado Salad"
Sounds delicious! I don't know much about Cuban food either but the dishes that do cross my radar always sound so yummy! I like how thinly sliced the meat is---makes for easy eating and tortilla packing. Scrumptious photos! Looks like such a fabulous summer meal! Vaca Frita is one of my favorite recipes and this variation of it...plus the salad makes this very enticing. This is the perfect dish for summer. Very refreshing!